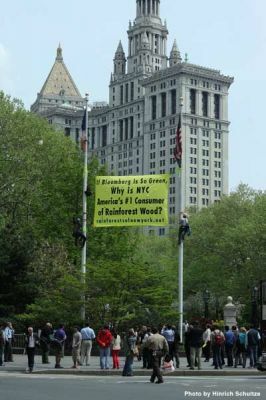 Two climbers scaled 40-foot flagpoles in City Hall Park April 21 and dropped a yellow banner demanding that New York City stop its use of tropical rainforest wood. 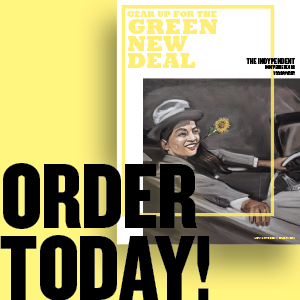 “It’s the 40th Anniversary of Earth Day and it’s simply unacceptable that the City is still using rainforest wood for public infrastructure,” said Tim Doody, New York City campaign coordinator for Rainforest Relief and climber on the west flagpole, in a press release. “We’re in front of Mayor Bloomberg’s office window and we hope our message is large enough for him to see it,” Doody said. This action has been organized by Rainforest Relief and the New York Climate Action Group (NYCAG). According to Rainforest Relief, the banner was dropped near to where the City has installed (or is currently installing) tropical timber include the decking of the Brooklyn Bridge, South Street Seaport, Battery Park, Fulton Ferry Terminal and Empire-Fulton State Park, fenderings and pilings at the Staten Island Ferry terminals, 12.5 miles of boardwalk, Hudson River Park, Washington Square Park, and the High Line, tens of thousands of park benches throughout the city, and hundreds of miles of subway track ties. 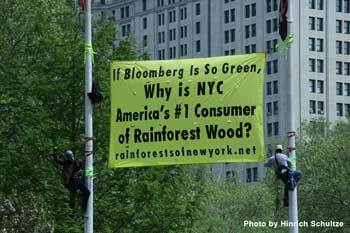 To read more about the action or about the use of rainforest wood in New York City, visit Rainforest Relief’s list of city projects. Photos courtesy Rainforest Relief.